Mullins said: "He never put a foot wrong from what I could see, but they are awful conditions. I was worried when we have had a race on the chase track already that it would have opened the ground and might not have suited Kemboy, but it looked like he had no problems seeking out that trip and further. Ruby Walsh, who has twice been leading jockey at the Randox Health Grand National Festival (2003, 2008), rode his first winner at this year's meeting when Kemboy won the G1 Betway Bowl Chase. Of Mullins's big-race contenders, Walsh chose Rathvinden this morning. He said: "I had him in mind for a long time. He won a four-miler at Cheltenham, yet he's won over shorter distances. He has a nice weight of 11st and he's a nimble little horse." The going has been changed on all courses to SOFT after the third race. Kemboy put the disappointment of a first-fence fall behind him in the G1 Magners Cheltenham Gold Cup with a sensational performance in the £200,000 G1 Betway Bowl over three miles and a furlong at Aintree today. 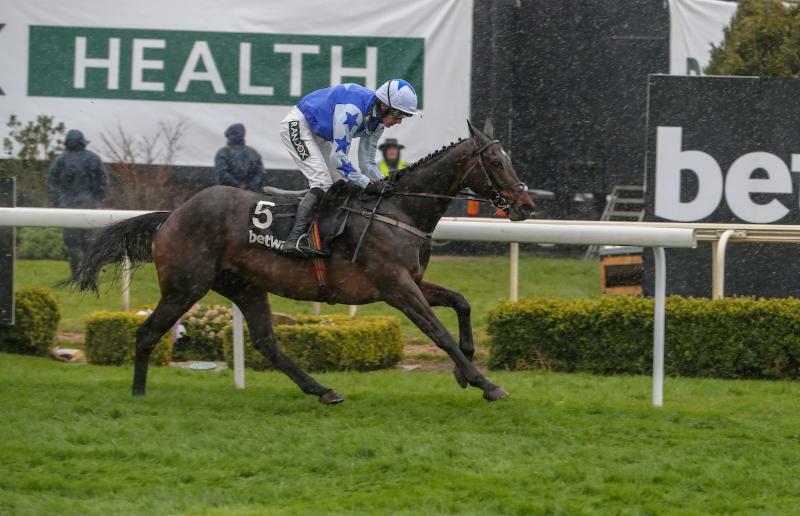 Trained by Willie Mullins and ridden by Ruby Walsh, Kemboy, the 9/4 favourite made most of the running and ran on strongly in the closing stages to win by nine lengths. King George VI Chase winner Clan Des Obeaux (11/4) kept on gamely in the closing stages to finish second for Paul Nicholls and Harry Cobden, a head in front of 20/1 shot Balko Des Flos, trained by Henry de Bromhead and ridden by Rachael Blackmore. Ditcheat handler Nicholls said: "Clan Des Obeaux ran well. We were very concerned before the race with all that rain as he does prefer better ground. "Clan Des Obeaux has stayed on strongly close home. He has had a long old season and with the winner falling at the first in the Gold Cup, he was always going to come into this race fresher. "The ground has gone against him, but you cannot do anything about that. He has just been beaten by the better horse on the day. "Harry did say he might be slightly better going right-handed, so we might consider that. I'm sure we'll aim him for the same sort of races next year and the King George will be one of his biggest targets as he loves it round there. "He goes OK left-handed and he's ran really well at both Cheltenham and Aintree, but he does seem to be better at tracks like Ascot and Kempton. "Clan Des Obeaux has had a great season winning a King George and a Denman Chase along with being fifth in the Gold Cup - he won't run again this season." Tom O'Brien aboard Elegant Escape (sixth), said: "It just didn't happen, Cheltenham just left its mark." Punchestown could beckon for Balko Des Flos (20/1) after the 2018 Ryanair Chase winner returned to somewhere near his best in third behind impressive nine-length winner Kemboy (9/4), losing second to Clan Des Obeaux (11/4) only in the shadows of the post after blundering at the last. Trainer Henry De Bromhead said: "That was much more like it. The bit of ease in the ground helped him and he ran really well, although we probably need to work a bit on his jumping. "I'm delighted to see him run like that. That mistake at the last cost him second, but obviously he'd never have troubled the winner." Reflecting on earlier disappointments this season, he added: "It's mainly that he's been sore. Running on real good ground at home has been killing him, and at Cheltenham he was very sore behind. "We've just had no run at all with him this season, but he's a very good horse and he's shown he's coming back to himself. If he's okay he's entitled to go to Punchestown. Why not?" Jockey Rachael Blackmore added: "That was a lot better. The mistake at the last probably cost us second but he ran back to the old horse he was."